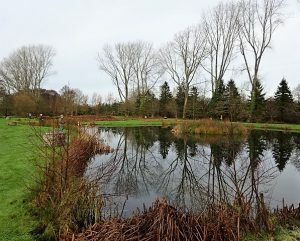 The third John Hardeley* Memorial competition was contested by eight members of the FDG’s Wessex branch, as ever held at Woodington Trout Fishery in the Test valley. It was cold, but no ice-breaking this year. The motley crew assembled, buoyed up by the crackling chimenea’s heat and the wonderful aromas of frying bacon and eggs, steaming teas and coffees. As before, we would compete over two sessions (before and after lunch) and were only permitted to carry six flies each. I have found pink to be a bit tasty at this venue, so my little box contained three pink-tinted, as yet unnamed prototypes of a Cat’s Whisker variant, plus three bankers: my #12 Limit Damsels. We all took great interest in examining each other’s selections; Sue L-P, the inaugural winner, had black/green versions of her successful fly (which was featured in Flydresser) whilst last year’s winner Simon W had one of his successful Zonkers plus five other patterns including a little black dry! I wondered at that, but during the day we did see some fish topping, albeit infrequently, and tiny midges on the wing. Woodington Trout fishery , natural beauty, even in winter. I set up the pink prototype on a glass line for its first field test. Why pink? I read somewhere that Rainbows favour pink as much as they do blue, (do I hear the sound of ‘Pink-flash Damsels’ being feverishly tied nationwide?). We spread around the banks and kicked-off; fingertips numbing quickly. 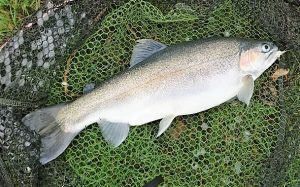 Not wishing to bore the reader by relating all the casting, retrieving, and occasional tree snagging, I’ll cut straight to the chase: I banked the first fish, from Kingfisher. Shortly afterwards I noticed Sue L-P into a trout over on Spring. I wandered down to try the Leat, to no avail. When I returned, I could see all eyes on Sue, bagging her second from that same swim. Spurred on, I headed to the other end of that bank on Kingfisher as Dave H was in my original spot. I had a hit but failed to connect, but two casts later I was playing my second, a tad bigger than my first. This being a ‘best brace from a two-fish ticket’ competition meant Sue and I were finished before lunch, we couldn’t fish any more but at least we could visit the chimnera to warm up. Two of the EA’s finest pitched up to check rod licences. That’s only the third such experience I’ve known in all the years I have been fishing; personally, I’m glad to see them checking. After an excellent BBQ lunch the fishless posse sallied forth again save for Derek L and Simon W, both of whom had got cold and dispirited in the morning session, a lethal combination causing them to give up. The management (Sian and Jim) deserve a special mention for the excellent catering they provided on basic camping equipment, whilst juggling two very young children! Oh, and let’s not forget the Victoria sponge at the finish! Sadly, Paul H and Peter H failed to catch, Dave H blanked as well, despite having two fish on briefly during the morning session. Paul E managed one in the last hour as the drizzle began to strengthen, and so this year the trophy will be living with yours truly, my brace weighing more than Sue’s by just ten ounces. I need a name for the fly; strangely I can’t come up with something that seems to fit. (My other pink pattern, years old now, is much more ‘in yer face’ and called the ‘Pink Sheila’, which sounds a bit antipodean). Any suggestions? The recipe follows below. (* John was a good friend to members of the Wessex branch and would give us discounts on fishing, tackle, and fly-tying stuff; he became ill and unfortunately died within days of selling the business). The Pink Prototype. Can anyone suggest a name for this fly? 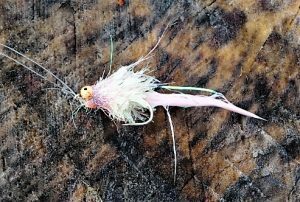 DUBBING: the fallen and leftover strands of pink and white Angelina, dubbed onto thread in a very thin noodle to wrap between and around the eyes to create a ‘head’. Whip finish at the hook-eye with varnished thread.